Eyes don’t sparkle … do they? Some plays on words confuse me; I might be taking their meaning too literally. 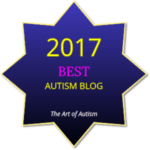 Autism – maybe not a spectrum but perhaps a galaxy, or a mosaic?